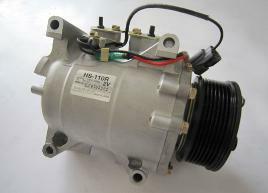 The compressor is a pump designated to raise the pressure of the refrigerant. Raising the pressure means raising the temperature. High temperature refrigerant vapor will condense rapidly in the condenser by releasing heat to the surroundings. The condenser is used to cool down the high pressure, high temperature gas of the refrigerant & change it to a liquid refrigerant. 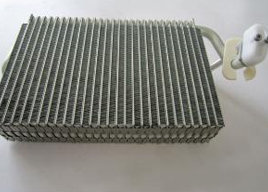 The greater the amount of the heat released off into the air through the condenser, the greater will be the cooling effect obtained by the evaporator. 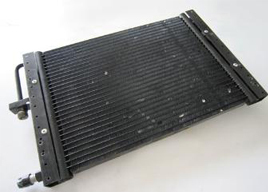 Therefore, the condenser is installed at the front end of the vehicle to get forcible cooling by the vehicle when moving. The purpose of the evaporator is opposite from condenser. It vapourizes the low temperature, low pressure mist refrigerant supplied by the expansion valve, thereby cooling the air around the evaporator. (1) The liquid refrigerant, after passing through the receiver is injected out from the orifice (expansion valve), which cause the liquid to suddenly expand & turn into the low temperature, low pressure refrigerant in mist form. (2) The expansion valve adjusts the volume of refrigerant supplied to the evaporator, according to the thermal load automatically. 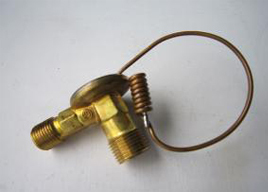 The receiver is a part of the system that is used to store the liquid refrigerant. 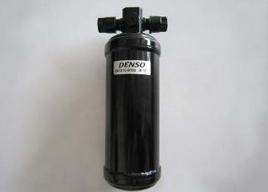 Also, the dryer & filter in the receiver remove the moisture & the dirt contained in the refrigerant.